I'm not sure, she has a memorable voice with that kind of raspy hush at the end, but I think it's fairly easy recognize her, she kind of sounds very similar in each ( the ones I remember: Jack, Fallout IV, Scarlett, etc). Anyone know of any program ( or has an uncle or relative working in government agency) that can "clean up" the recording? Yea, I get where some people are already getting tired of it are coming from, lol. And I'm someone who was not excited before, but bought into the hype, in a major way. What adds to this feeling is that we will be subject to this hype machine for the next months to years, depending on when its released. I'm not saying don't be excited, but it can get tiring - and even annoying - when something becomes over-hyped. It happens a lot in our society nowadays, from movies to games. But especially games, where every second of footage is analyzed to death and discussed by overly hyped-up gamers/fans of the anticipated title. Anyway, just my 2 cents. Don't burn me at the stake! They are all similar because it's basically Courtenay's normal speaking voice, but the raspy hush is not always as pronounced. I was never 100% on her being V though, it mostly sound like her in the second part of the leak and I didn't know any other voice actress with a similar voice to that. E3 demo sounded great and was easy enough to follow without video too. Sadly sounded like there is pretty much no chance for a video leak but hopefully CD will fill up the that void themselves. From what I understand, it seems to be focusing more on the side of "punk". What we saw in the trailer showed us a more modernized approach to a cyberpunk world: people driving cars, playing pool, playing VR, going to fashion shows, things like that. At the same time, crime rate is up, people are homeless, civilians are fighting, etc. In the meantime, technology has taken steps forward (prosthetic arms, a woman/robot doing her eyelashes while the bottom half of her face has been removed, etc). We're seeing less science fiction, and more "what the future would look like if humanity worsened, but technology improved", which is probably not too off from our reality. In that sense, it's not entirely science fiction. You described the game I saw in the trailers much better than I could! I guess I have never been interested in such a setting. I don't mind seeing movies about it but setting it self has never grabbed in the same was as fantasy or mass effect like sci fi. For me, that is exactly what good science fiction is about. Thinking about the "what ifs" of fields like science, technology and society. How far the extrapolation goes into our potential future does not affect whether it is science fiction. Indeed, you could argue that as well - science fiction can and often takes the form of a "what if" scenario. We typically attribute sci fi to the advancement of technology and such, but we forget the human side of science fiction. I think Cyberpunk 2077 is definitely shaking up the established formula of what a cyberpunk world typically looks like - night life in the big city, abundant lights, neon colors, 3d holograms, etc. At least, that rings true for me, because the first thing I picture when I think of a cyberpunk world is this, not this. In the Cyberpunk 2077 trailer, there are vehicular transports that function by both air and ground. There's interesting diversity there, and typically I vision cyberpunk worlds to have only flying cars. And that's only one small detail. I wonder what else is shaking up the formula. Although I'm not interested in the game until I learn more about its RPG mechanics, I find it interesting to follow. Amazing that the trailer has generated over 12 million views already, too. Last edited by Ragnaris; June 21st, 2018 at 17:36. I would say that the original works that defined what became known as cyberpunk did not necessarily have the dark, neon imagery - that really came later as it was kind of merged with film-noir. Originally, it was really just science fiction that moved away from the fantastic visions of the future, or Martian invasions, and brought it back the gritty realities of what fallible human societies would probably be like with such technological advancements. Also, a focus on the ordinary "punks" in the street, rather than great heroes. The vision CDPR have gone for feels fine, to me. I think that's true to a point. A lot of the earliest works came from books, and a lot of that imagery had to be, well, imagined, unless it was just flat out described. I usually pictured dark settings with less neon lighting until Blade Runner came along. 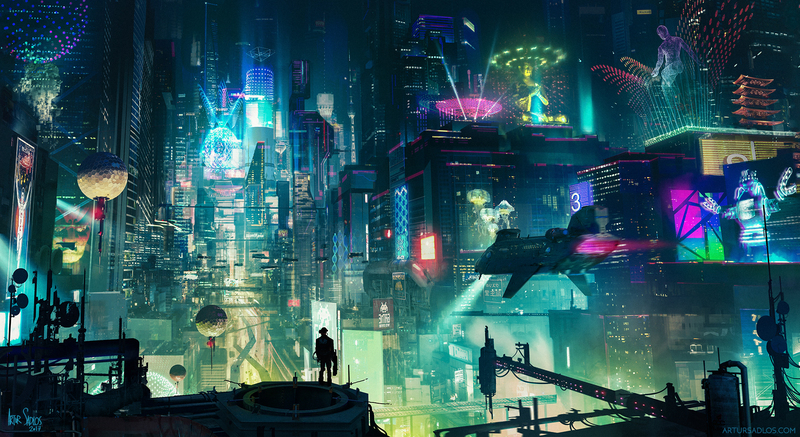 Cyberpunk moved away from the utopian settings that we came to expect from sci fi. And you're 100% correct. It featured punks, life in the slums, that sort of thing. The trailer capitalized on that, and I think that was the intended purpose. Technology had no doubt improved, but I don't think it was the primary focus. It probably just goes without saying. I think a lot of the complaints I see have to do with atmosphere, mostly (again, night life, city lights, etc). And I can understand that, it's a very appealing theme. I adore Blade Runner for that reason. The idea of the collapse of society never disappeared, but the aesthetic did (again, based on the trailer), and I think that's what people are missing. Additionally, the trailer wasn't focused on someone in a unique position or someone in a place of power where it typically does, like Deckard. Instead, it generalized the life of a cyberpunk world by shifting the camera toward random groups of punks and thugs. I think the players wanted to see a hero or hacker or something, and they didn't get that. I like that CDPR is going against the grain of the established norm. However, Cyberpunk 2077 doesn't entirely grab me yet. Although admittedly, it never did. Maybe that will change, maybe it won't. I'll continue to follow it in the meantime. I'm starting to wonder if journalists were asked to release their interviews very slowly or they are just doing it to keep the clicks going. Polygon posted (part of) their interview Adam Badowski (CP77 game director) with today. Which are really dumb complaints since they're trying to judge the game's atmosphere from a teaser trailer. Atmosphere imo is not something you can grasp until you've actually played the game. Agreed. Or, at least, wait for another trailer where they show off something new. One trailer isn't 100% representative of the full game. We haven't even had a chance to see weather or day/night cycles, have we? From what I could tell it will be a mix of several influences, possibly based on what part of the city: Judge Dredd ( industrial), Akira/Ghost in the Shell ( eastern), Blade Runner and modern world/GTA ( since they're faithful recreation of American cities). It simply won't be just Bladerunner. Also reiterates how it "feels finished", but needs more polishing/optimization. Not sure about what resolution they were running it on, there is till debate on this ( could be from 1080 to 4k). Seems a strong CPU and high memory ( to get most out of this).